Last time we visited was in 2005 when it was still “Paramount Kings Dominion.” The park has since then been acquired by Cedar Fair, with a bunch of stuff added, renovated, or rebranded. 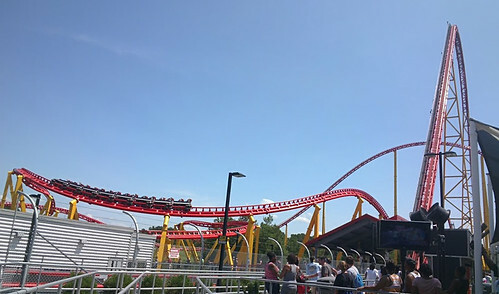 I was especially keen on trying Intimidator 305, a new NASCAR themed Intamin coaster with a 300 foot drop and 5G turn, known to cause blackouts in some riders. We also braved the two hour line for Volcano, a twisty dual-launcher built around the shell of what was once Smurf Mountain. 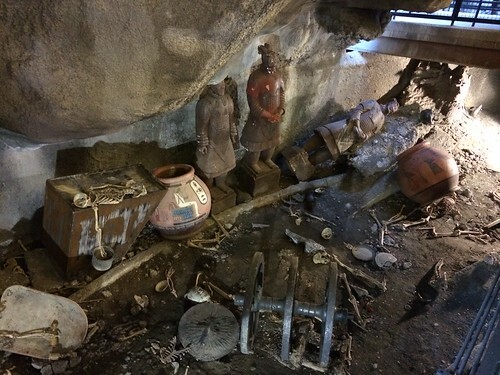 Worth the wait, especially with the amusing mishmash of archaeological replicas gracing the platform tableau. 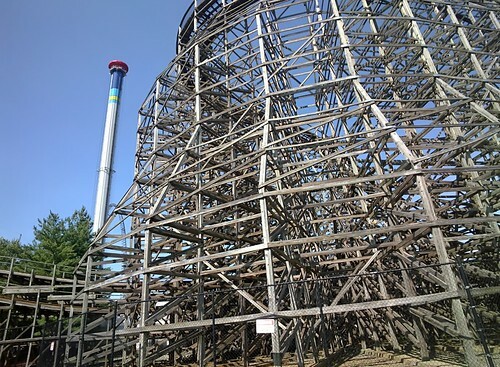 The classic wood coasters were all fun rides as well: Rebel Yell, Hurler, and Grizzly. 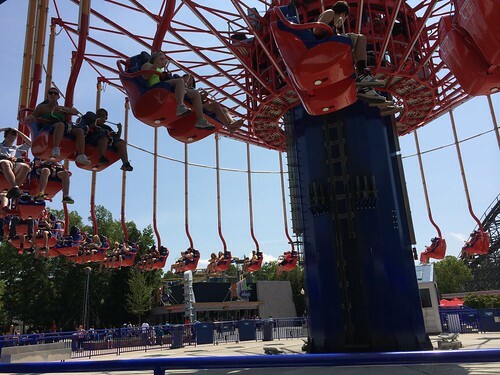 Couple of things I didn’t know before: Grizzly was modeled closely after Coney Island’s historic Wildcat coaster, now gone; and Kings Dominion used to have a Wayne’s World-themed section, of which the only remnant left today is the Hurler. We also tried riding Ricochet, a Wild-Mouse coaster, but I didn’t much enjoy the tight unbanked turns common to this genre. Backlot Stunt Coaster (formerly Italian Job) was supposed to evoke the feel of a high speed car chase, though it could have stood alone as a decent steel launched coaster without needing the police cars and simulated helicopter attack. 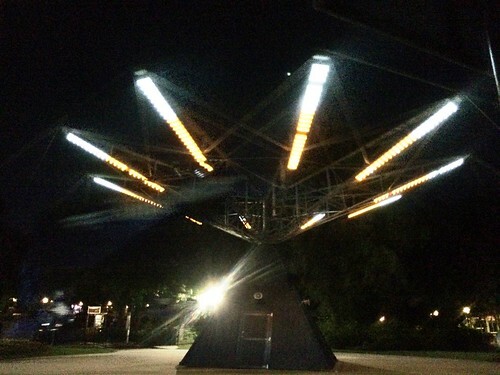 Other fun rides: Windseeker, a very high-up swing ride; and Flying Eagles, revolving scooters with swingable fins to control the flight. I’m still not sure whether the Cedar Fair Kings Dominion is better than Paramount. In a telling sign of the times, the route to the Grizzly coaster has been built over such that you pass through the store and by the entryway for “Dinosaurs Alive,” a paid attraction. Food is certainly pricier and concessionaire cleanliness was a bit less than stellar, but rides have increased in variety and intensity, and for better or worse there’s a somewhat more carnival-like ambience. We just don’t visit often enough to compare. We missed a few attractions due to lines and crowds but we’ll be back. Full photo album here.